The problematic racial politics of Othello are scrutinised for a good reason. You have a play that centers around a dark-skinned man being tricked by, typically, a light-skinned man, into killing his white wife. So, looking at it as a modern audience, is it an examination of otherness or a perpetuation of it? Director Ben Naylor’s production doesn’t attempt to wrestle with this problem. This is, first and foremost, an attempt to faithfully realise the text as is. And as anyone who is familiar with the play knows, the appeal isn’t in seeing Othello suffering, but in seeing Iago succeeding. After all, it’s Iago who we open the play with, and his eyes through which we see most of the other characters. So, while tackling the racial politics of the play would be appreciated, especially in a modern context, it never feels entirely necessary here. For a production like this to work you need a charismatic Iago, able to balance despicable with alluring. Haakon Smestad has this in spades, giving the role of the infamous sociopath a masculine swagger as well as seductive tongue. Like it or not, it’s ultimately Iago we identify with, who speaks to us most directly throughout the play. And we happily watch him as he topples his victims over like dominoes, one after another. What is especially noticeable here is the gender politics. There’s never a question that Othello is a play set in a man’s world, where women are relegated to the role of wife, maid or whore. It’s an especially outdated view, but one that gives greater strength to the characters’ attempts to resist it. Despite being stuck in these limited boxes, the females in these roles cultivate a strong sense of identity. First off is the true victim of the story, Desdemona. Jasmine Blackborow brings a stunning amount of strength to the typically fragile victim of the tale, often playing against the character’s obvious softness. We don’t see a virginal princess being punished, but a women with a real passion inside of her slowly broken down by what is inarguably domestic violence. Roimata Fox, on the other hand, plays an initially more subservient Emilia than I’m used to. But this works well to highlight the unbalanced power dynamic between her and Iago. When she finally comes bursting out with her speech on the differences between men and women, it’s a well-earned moment of temporary liberation for the character. Victoria Abbott is mostly stranded as comic relief in the role of Bianca, but even this is given a sense of personality. She owns what might otherwise be a crass caricature of a female strumpet, and brings a plot device to life. 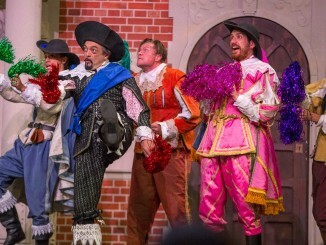 The other overtly comedic character is Kieran Mortell, who plays the hammiest Roderigo I’ve ever witnessed, more suited to the shenanigans of Twelfth Night than the tragedy of the Moor. But somehow it works, especially in the Pop-Up Globe venue, which tends to reward the excessive over the subtle. He’s effectively Iago’s pinata, who’s repeatedly smacked about until the pathetic end. Cassio, the other pawn to Iago’s game, is played confidently by Daryl Green, capturing the well-meaning everyman quality. He’s believable as collateral damage, an innocent bystander who is too easily manipulated and susceptible to the vices of male camaraderie. The rest of the cast is also uniformly strong, the only noticeably weak link being Othello himself, played by Te Kohe Tuhaka. It’s by no means a bad performance, just an inconsistent one that only captures one facet of the character in its entirety. The biggest flaw being that Othello’s supposed eloquence is somewhat lost during the longer stretches of dialogue, where intention of thoughts and ideas aren’t clear. Where Tuhaka does excel is in the more physical scenes, where his body can do the talking. And when he eventually turns into a machine of pure rage and jealousy in the second half, that’s where he shines, his voice booming without restraint. The murder scene between Othello and Desdemona is particularly hard to watch, drawn out and truly uncomfortable. But he’s not a fully-developed person here, just simply the victimised other. 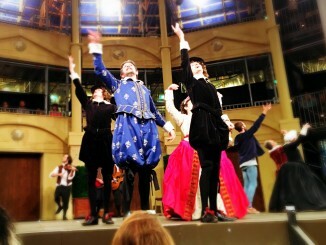 The Pop-Up Globe have put on a highly respectable production of Othello, embracing the sadistic glee of the play. While the rest of the show overshadows the title character, it’s never a detriment to the goals of this production. What it sacrifices in terms of the racial problems, it makes up for in Iago’s Machiavellian scheming. Rather tellingly, Naylor not only has Iago roll Desdemona out on her bed for her final scene personally, but also gives him the best exit. This is Iago’s play, no doubt about it. 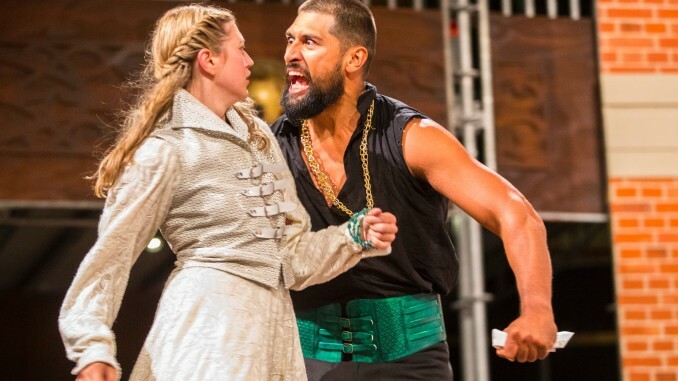 Othello plays at the Pop-up Globe till May.